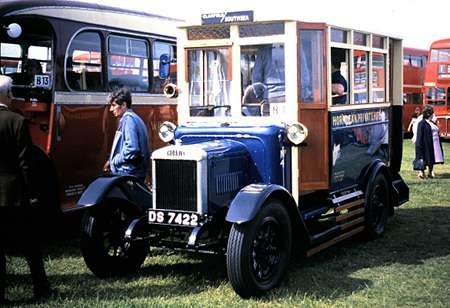 DS 7422 is shown in the PSVC listing for 2012 as being a 1926 Morris Commercial 1 Ton vehicle, with B10D body by Harris of Clanfield. She’s seen here in the Southsea Rally of 8 June 1986, in the markings of Horndean Private Hire. The listing says this is the original body, but rebuilt, rather than a replica. Cute little motor but it would also be nice to see a Viceroy, Dictator or Imperial. Yet another set of might have beens outrun by the big four (AEC, Bristol, Daimler and Leyland). I wonder how this quirky vehicle survived? How I mourn the loss of Horndean’s Gales Ales Brewery. The sad-looking building was still there when I last passed it a couple of years ago. David, an Imperial survives at Wythall, as does a Dictator. I don’t know of a Viceroy in preservation, though I sure someone will correct me if there is! Yes, Chris. The brewery tours were very good, always ending in a ‘sample’ or three! David: Probably not much of a ‘might have been’ in practice. Nuffield surely had the resources to have gone into large passenger vehicle construction in a large way if he had felt it worthwhile. However, the Morris Commercial brand was clearly doing very nicely with its near monopoly of vehicles for the GPO, so they probably never tried too much for sales outside this field. The post-war production was very much on the back of goods chassis, in an area where of course the OB had cornered the market. Thanks for that, Roger. I have every respect for those of us who lovingly restore and conserve these vehicles but, as you say, with some you wonder whether the outcome will be happy. And yet they do it. Thx, Roger, for the background information about MC and CK Edwards. Strangely enough, in my RAF days, I had under my charge, about thirty Hands trailers, a make I never saw before of since. It really is a small world, isn’t it? I’ve mentioned elsewhere in these pages about my student days in Birmingham. To be precise, I was at St Peter’s College in Saltley, NEXT DOOR to the Adderley Park works Roger mentions. They were either on strike or making Post Office vans. All those I saw were red, but I’m sure they must have done some of the Post Office Telephones green ones as well! I love the upright windscreen on that little Morris-Commercial, and the livery couldn’t be bettered, as Midland General knew. I’m grateful for Roger’s technical pages: details like that are otherwise very hard to come by. Chris H: I hadn’t realised that Gales of Horndean had sadly closed down, but a quick search reveals that the tower is thankfully to be kept as part of the new housing scheme. I occasionally drove through Horndean with Smith’s and felt that the brewery gave the town real character. On cycle rides in the fifties I used to wonder why three pubs between Reading and Woodcote belonged to a brewery nearly fifty miles south, but my grandma (born on a nearby farm) explained that a Gale had married a Miss Blount, from a S. Oxfordshire family, a connection that enabled Gales to buy the pubs. I’m surprised that no-one has commented on the registration no. of this vehicle, DS 7422, which cannot be the original. DS was issued to Peebles-shire and its registration series had reached only as far as DS 6396 when the "year letter" series began in the 1960s. I assume the original was sold as a "cherished" plate and replaced. Unused numbers from small Scottish counties were normally used in this way as so few had been issued prior to 1964. With regards to the original number for DS 7422 it may have been lost prior to John Harris ‘rebuilding’ the body. From what I have been given to understand it was built from a lorry chassis, as were many of Mr Harris’s creations. I knew the last owner of DS 7422 the late Richard Payne well & viewed the vehicle whilst it was with him. Aspects of it led me to believe it to be a replica, including moulded rubber Lucas King of the Road ‘vintage rear lights. Mr Harris built several similar bodies on Morris 1 ton chassis & a Bedford WLG RVS 305 (another ‘age related number) but with shed like freelance vintage body for promotional use. DS 7422 was recently sold in Richard Payne’s sale for £14,200 (hammer price) to a Mr Maskell of Wilstead Bedfordshire.